Ferozepur: Bhai Dhian Singh Mand, who was declared to be acting Jathedar of Akal Takht Sahib by the organizers of the Sarbat Khalsa 2015, was released from Central Jail, Ferozepur today. Bhai Mand who is a former MP and a former senior leader of Shiromani Akali Dal Amritsar (Mann) was granted bail by Ferozepur sessions judge H. S. Grewal yesterday. 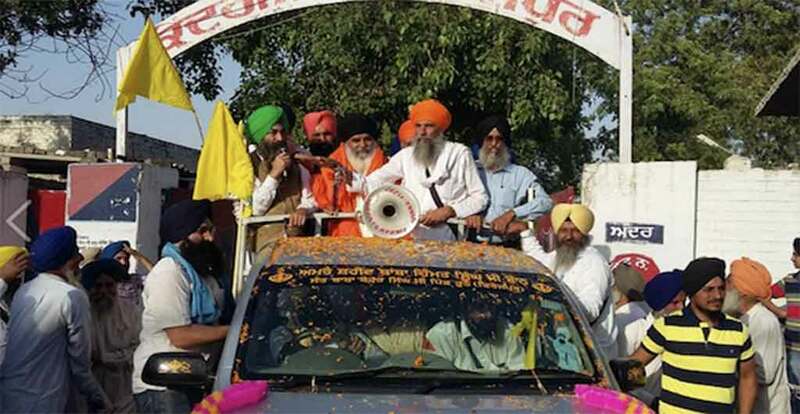 Supporters of Bhai Dhian Singh Mand, including SAD (Mann) leader Jaskaran Singh Kahan Singh Wala, Satnam Singh Manawan welcomed him outside the Ferozepur jail. Pictures :- Beadbi of Sri Guru Granth Sahib Ji in Village Bahauddin, district Sirsa, Haryana ;Culprit arrested.